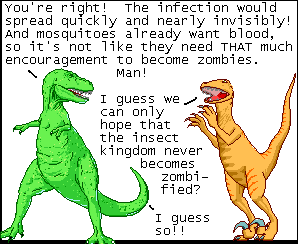 This page is a toy to play with Dinosaur Comics. 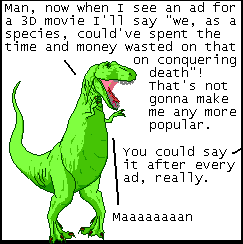 Dinosaur Comics is a web comic created by Ryan North. The unique thing about it is that the pictures are the same (nearly) every day and only the words change. 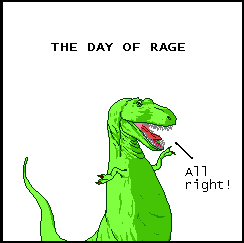 This means that if you combine panels from multiple days, the comic will still look right. That's what this page lets you do. You can randomly mix together panels from multiple comics, keeping the ones you like until you arrive at a complete comic, and then save or share the link to it. 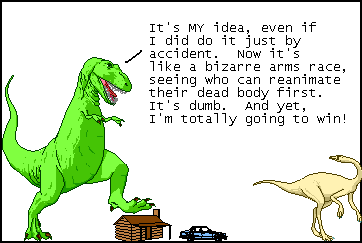 There are a lot of possible comics you can make. 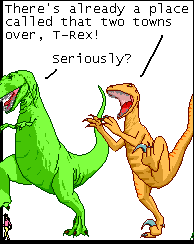 Dinosaur Remix currently contains 3326 comics, making for 1,353,734,413,467,634,106,368 possible remixes.